Like many coastal towns across Rhode Island, Westerly has long welcomed visitors from near and far – and it’s not hard to imagine why. This charming beachfront community is teeming with character, distinctive villages and neighborhoods, and local pride. But downtown Westerly seems to be having a moment, or as some locals will better describe, launching a new era. “Westerly is definitely a growing community,” says business owner Annie Philbrick. “Many younger people live there as it is less expensive, and fun to walk to the bars and around town.” Philbrick has been the owner of Bank Square Books in nearby Mystic, Connecticut for more than a decade, but in 2016, she opened a sister shop, Savoy Bookshop & Café, in Westerly. The whimsical, independent bookstore feels like a trek back in time with tall, handsome bookcases, high ceilings, near floor-to-ceiling windows, and cozy reading nooks inviting bibliophiles and wandering visitors alike to relax and stay a while. The neighborhood bookstore was the brainchild of investor Charles “Chuck” Royce, best known for spearheading the revival of the Ocean House in nearby Watch Hill. Royce has been coming to the area since the early 1980s, and there’s no doubt that when he reopened the grand Ocean House hotel in 2010, the southwestern shoreline of Washington County had reclaimed a bygone era. “Community” seems to be a running theme among businesses here. Alan and Jennifer Brinton were among some of the earlier business owners to invest in what some are calling Westerly’s new chapter. The couple felt complete support from the town when they opened Grey Sail Brewing there in 2011. Dana and Mark Carvey moved to Westerly two years ago for the abundance of young people, the vibrant downtown and the ‘little bit of everything you need’ that the town offers. The couple was eager to open a pinball bar and had also considered New Haven, Mystic, and New London as possible locations. Ultimately, Westerly won out. “The vibe in Westerly is a cross between New London and Mystic. It’s small; I like that you can walk everywhere. It’s safe and near the beach – it’s the perfect location,” says Dana. Case in point? Colin Bennett, who owns The Malted Barley on High Street with his wife Stephanie, liked playing pinball so much with his son that Dana and Mark installed two pinball machines from Flip Side at the craft beer and pretzel pairing outpost. The action was more than neighborly; it organically cross-promotes. It’s not just new businesses that make Westerly extraordinary; it’s music, arts, events, and unique experiences. The newly branded Knickerbocker Music Center (formerly the Knickerbocker Café, but usually just called “The Knick”) was first established in 1933. Although the building completed a major renovation 2009, the center’s executive director, Mark Connolly, says the plan all along was for the façade to remain identical to the original. The club has its roots in blues music, and such wide-ranging artists as Count Basie and Stevie Ray Vaughan played here quite a bit. Royce is also financially supporting the United Theatre’s multimillion dollar renovation. 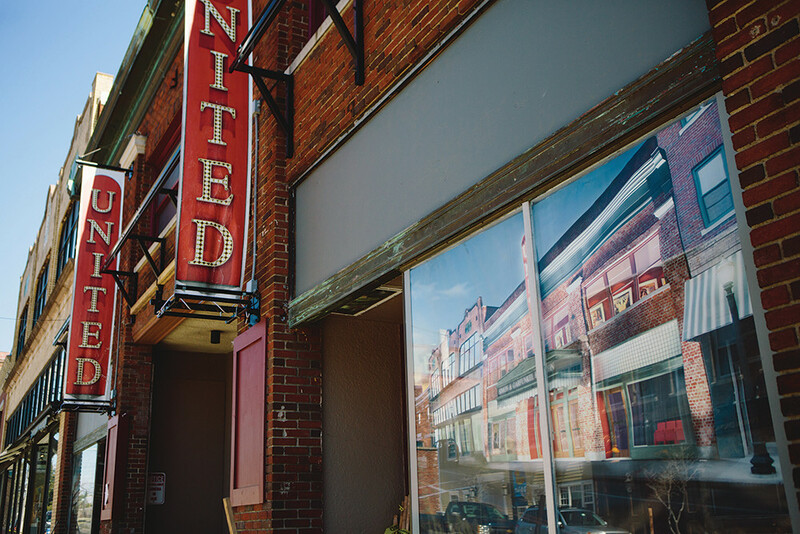 Officially renamed the Ocean Community United Theatre, the former vaudeville theater dates back to 1926 and will hold events and performances while being the home of the music education center. The theater already hosts special events and this summer will continue the Movies in the Park series in conjunction with Westerly Library and Wilcox Park. Last September, one wall of The Knick became the biggest canvas in the inaugural Bricks and Murals festival, a five-day event which included live mural painting by more than 100 artists, live music, a food stroll, and a block party. The Knick’s history was portrayed in a painted piece covering the entire wall, measuring 114 feet wide by 20 feet high. The event was a rousing success. It’s events like these, says Lisa Konicki, president of the Ocean Community Chamber of Commerce, that solidify Westerly as an arts and cultural destination. Konicki says Brick and Murals, River Glow (when floating bonfires illuminate the Pawcatuck River), the Virtu Art Festival (happening in Wilcox Park this month on May 26 and 27 and will feature the fine works of 180 artists/craftspeople), and the proposed “gateway project,” which would showcase the bond between Westerly and neighboring Pawcatuck, Connecticut with an iconic, artistic piece on the Pawcatuck River Bridge, are examples of events that celebrate the area’s culture and history. Events like these are crucial to growing the local economy. Konicki says a study conducted at the Virtu Art Festival showed the event generated $6.6 million in economic impact. The study also provided insight into who is visiting Westerly. More than half of the Virtu visitors came from out of the immediate area and a quarter of them were first time visitors. Westerly’s magnetism hasn’t gone unnoticed. In 2016, Movoto.com, a national online real estate company, ranked Westerly as the best place to live in Rhode Island, citing its effervescent dining scene, low unemployment, student-to-teacher ratio, low crime rate, and overall quality of life.